Occurrence: Usually eaten cooked but also as sushi. Allergy to fin fish is relatively common (0.4% of adults in the USA according to one telephone survey), and can be associated with severe symptoms such as anaphylactic shock. Symptoms can also occur after ingestion of only a small quantity of fish with one reported reaction in an individual after receiving a kiss from someone who had recently eaten fish. Allergy to fish is not to be confused with a toxic reaction to histamine in spoiled fish (scombroid fish poisoning). Almost all fish allergy seems to involve the protein parvalbumin, which is found in the muscle of most fish. As the parvalbumins are similar in all fish species, individuals allergic to one fish are likely to react to a range of different fish species. Thus after a diagnosis of allergy to one fish species, patients are normally advised to avoid all fin fish. Some individuals also react to frog. Although fin fish and shellfish allergies are not linked, individuals can be allergic to both foods. Parvalbumin remains able to cause a reaction after cooking. Thus fish remains allergenic after cooking and other treatments. Fish can be a "hidden" allergen in, for example, pizza toppings. Consequently, the EU labelling regulations require foods containing fish and products thereof to be labelled. Fish and fish products play an important role in human nutrition. Fish is a valuable source of proteins and contains large amounts of healthy fats (so called polyunsaturated fatty acids) and fat-soluble vitamins. However, it also is one of the most common causes of food allergy. Fish allergy is a so-called IgE-mediated food allergy. IgE (Immunoglobulin E) is the allergy antibody. Reactions can be severe and even life-threatening. The severity of symptoms may vary according to the amount ingested and the sensitivity of the person. Often the first symptom is irritation and itching in mouth and throat appearing few minutes after the intake. It can be followed by other allergic reactions such as nausea, vomiting, stomach ache, diarrhoea, hives (also called urticaria or nettle rash), swelling under the skin (also called angioedema), itching and reddening of the skin, worsening of eczema, asthma (wheezing, breathlessness, coughing), hay fever (itchy nose and eyes, sneezing/runny nose), swelling of the airways, and sometimes fatal episodes of allergic shock. Usually a combination of several symptoms is seen. Spoiled fish can contain a substance called histamine. This is the same substance that is produced by cells of an allergic patient during an allergic reaction. It is involved in the induction of symptoms. Spoiled fish can elicit symptoms in every person having eaten it. The reaction is similar to an allergic reaction, i.e. swelling, hives, wheezing etc., but it is poisoning. Most information on fish allergy is gathered on codfish. The variety of fish eaten around the world is immense. Despite this, fish species known to cause allergy belong to a few closely related orders: codfish and hake (Gadiformes), mackerel, tuna and perch (Perciformes), salmon and trout (Salmoniformes), plaice and sole (Pleuronectiformes), herring, anchovy and sardine (Clupeiformes), carp and catfish (Cypriniformes), and eel (Anguilliformes). Patients with allergy to codfish are often allergic to the other fish species as well. This can be explained by similarity of the allergen parvalbumin in all fish species. Allergic reactions based on such similarity are called cross-reactions. The cross-reactivity between fish species is certainly not complete. Some patients are allergic to one and tolerate other species. Allergy to fish does not mean that other seafood like shellfish is not tolerated. Cross-reactivity is irrelevant between fish and shellfish. Of course, patients can develop allergy to both independently. Fish roe (or caviar) has been reported to cause food allergy but there is no relation to allergy to the fish from which the eggs originate. Finally, it has been reported that parvalbumin in frogs legs can in some cases also cause allergy in fish allergic patients. This again is cause by cross reactivity. Food allergy to fish is seen both among children and adults (approximately 0.1-0.2%). Varieties in food habits according to country influence the frequency patterns of fish allergy, with the number of fish allergics being higher in those countries where fish is a major component of the local diet. In general, fish allergy is not outgrown but it persists through life. Care has to be taken since very small amounts (few mg, in other words a tiny flake) of fish can elicit a reaction in very sensitive persons. A dose of only 5 mg of cod has been described to cause reaction. Furthermore, some fish allergic persons can get allergic symptoms due to the steam (airborne allergens) from cooking fish. Fish allergy is therefore sometimes a problem in the fish industry and among restaurant cooks, where handling and inhalation might cause eczema and asthma. Finally, even a kiss of somebody that has eaten fish can induce a reaction in a fish allergic person. An indication for IgE-mediated fish allergy can be obtained from skin prick testing and from serum IgE testing. The presence of a positive skin prick test or of fish protein-specific IgE-antibody in serum is indicative of an IgE-mediated fish allergy, but both tests may be false-positive or false-negative. Therefore, a definitive diagnosis has to be based on strict, well-defined elimination and re-introduction protocols or on controlled fish challenge procedures. Fish allergy is confirmed if symptoms disappear after elimination and re-appear upon re-introduction or if a so-called double-blind placebo controlled food challenge gives a positive result. During such a challenge both doctor and patient do not know which challenge meal contains fish and which does not. Such challenge procedures are also helpful in determining the threshold dose of reactivity, and to verify if a person has outgrown the food allergy, although this is rarely seen with fish allergy. It is important to study the labels on processed foods since various products can contain fish: surimi (fish product imitating crabmeat), fish meal, animal fat, liver pâté, some sausages, crab salad, sushi, oyster sauce, Worcestershire sauce, Caesar salad, tapenade, and pizza toppings. Fish oils/animal oil can also contain fish proteins, depending on the degree of refining of the oil. Fish gelatine made from skin and bones and used in food products is not considered to present a risk to fish allergic persons at the doses typically used. Fish gelatine is applied in pharmaceutical products like vaccines, but it is not considered a risk to fish allergic persons. If suffering from fish allergy, strict avoidance of fish in any form and food containing fish-derived ingredients is the only way to prevent a reaction. This can sometimes be difficult because they can be hidden in food products. According to the new EU labelling directive (2003/89/EC) and the list of the Codex Alimentarius Commission, any fish-derived ingredient has to be listed on the label. Even if labels are carefully read, unintentionally and accidentally consumption of fish may happen. Fish allergic individuals should especially be cautious when eating away from home. When ordering a “non-fish meal” at a restaurant it may be contaminated with fish proteins from utensils, cooking oil or a grill exposed to fish. Other Information: The carp image was created by Duane Raver and is from the USFWS National Image Library. Taxonomic Information: NEWT 7962 (common carp). Several other related fish include carp in their name i.e. 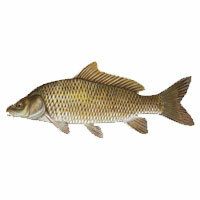 bighead carp, crucian carp, grass carp, mud carp, noble carp and silver carp. Bugajska-Schretter et al. (2000)  reported the symptoms of 13 patients allergic to fish (10 adults, three children), all of whom had IgE antibodies binding carp parvalbumin. All patients were allergic to more than one fish species and experienced at least one of the typical clinical symptoms (dermatitis, urticaria, angioedema, diarrhoea, asthma, anaphylactic reaction) after contact with fish proteins. Bugajska-Schretter et al. (1998)  similarly report the symptoms of 30 fish allergic patients as dermatitis, urticaria, angioedema, diarrhea, asthma, or anaphylactic reaction after ingestion, inhalation, or skin contact with fish proteins. Although not all symptoms were not specifically associated with carp, the 28 sera tested from these patients showed IgE binding to carp parvalbumin. Data on 4 representative patients noted that 2/4 had shown clinical symptoms after carp ingestion of urticaria and urticaria plus asthma . Food/Type of allergen:de Martino et al (1990)  used commercial extracts (Lofarma, Milan, Italy). the extracts were diluted 1:20 (w/v) in a glycerol solution. Protocol: (controls, definition of positive etc)de Martino et al (1990)  used histamine hydochloride, 1 mg/ml, as a positive control and a glycerol solution as a negative control. Diameters were read after 15 minutes and reactions half or more than the size of the positive control, read after 10 minutes, were considered positive. Number of Patients:de Martino et al (1990)  tested 20 cod allergic children and 40 children who had a positive SPT and RAST to a different food. Summary of Results:de Martino et al (1990)  reported that 5/20 of the cod allergic children reacted to carp extract. None of the cod negative children reacted. Food/Type of allergen:Commercial extracts were used for CAP-FEIA and Bugajska-Schretter et al. (1998)  made an extract with one gram of raw fish muscle of each species, homogenized under liquid nitrogen, dissolved in Laemmli sample buffer, with or without 2-mercaptoethanol (1.25% v/v), and boiled for 10 minutes. In order to remove insoluble particles, extracts were centrifuged at 4500 rpm for 10 minutes at 4° C, and supernatants were stored in aliquots at –20° C.
Bugajska-Schretter et al. 2000  tested sera from 13 patients allergic to fish (10 adults, three children) with a positive case history of type I allergy to fish. Bugajska-Schretter et al. (1998)  tested sera from 30 patients allergic to fish with a positive case history of type I allergy to fish. 28 were tested with carp parvalbumin by immunoblotting. Bugajska-Schretter et al. (1998)  report positive RASTs, class 2-4, with all 30 patients with cod extracts and class 1-4 with salmon and tuna (only 29 tested with tuna). The degree of inhibition of IgE binding to tuna, salmon, perch, carp and eel obtained after preadsorption of the four sera with cod extract was determined by gamma counting giving 43%, 93%, 84% and 73% for carp. Immunoblotting separation:Bugajska-Schretter et al. (1998)  and Bugajska-Schretter et al. 2000  separated proteins using 12% SDS-PAGE, by the method of Laemmli (1970) . Extracts were heated at 95° C for 3 minutes. Bugajska-Schretter et al. (1998)  and Bugajska-Schretter et al. 2000  blotted proteins separated by SDS-PAGE or IEF onto nitrocellulose membranes (Nitrocell, Pharmacia Biotech) or polyvinylidenedifluoride membranes (Immobilon PVDF, Millipore, Bedford, Massachusetts, USA) by the method of Towbin et al. 1979 . Nitrocellulose strips and PVDF membranes containing blotted proteins were blocked at room temperature in PBS, pH 7.5, containing 0.5% (v/v) Tween 20. Strips were then probed overnight at 4°C with sera, diluted 1:10 (v/v) in the same buffer. Bound IgE antibodies were detected with 125I-labelled anti-human IgE antibodies (Pharmacia) and visualised by autoradiography. Bugajska-Schretter et al. 2000  report that binding of IgE from 4 sera from fish allergic patients to carp parvalbumin is reduced 59%, 51%, 79%, and 27% on removal of calcium. Preincubation of sera with purified pI 4.7 form of carp parvalbumin strongly inhibited IgE binding to the other isoforms and to extracts of cod fish, tuna, and salmon, absorbing, on average, 83% of fish-specific IgE antibodies. Similarly, Preabsorbtion of sera from fish allergic patients by purified carp parvalbumin either abolished or greatly reduced IgE binding to nitrocellulose-blotted extracts of carp, cod, eel, perch or salmon (Swoboda et al 2002 ). Bugajska-Schretter et al. (1998)  reported that all 28 sera contained IgE binding a protein in cod and carp extracts at 12 kDa (parvalbumin). 7 sera also bound other minor allergens in cod extract of 200, 100, 80, 66, 35, 30, 25, 20, and 15 kDa. Periodate treatment of the blotted extracts strongly reduced IgE binding to parvalbumin with the 3 sera tested, suggesting that either carbohydrate or free cysteine residues are involved in IgE binding. Calcium depletion with EGTA strongly reduced binding to parvalbumin but not to minor allergens with 9/14 sera tested. Reduction did not change IgE binding. The degree of inhibition of IgE binding to tuna, salmon, perch, carp and eel obtained after preadsorption of the four sera with cod extract was determined by gamma counting giving 43%, 93%, 84% and 73% for carp. Symptoms:No oral challenge has been reported with carp. Carp allergy has been reported to involve parvalbumin and there is extensive IgE cross-reactivity between cod and carp (Bugajska-Schretter et al. 1998 ) and also between carp and eel, perch, tuna and salmon (Bugajska-Schretter et al. 2000 ; Swoboda et al 2002 ). For example, Swoboda et al 2002  report that rCyp c 1.01 strongly inhibited IgE binding to natural fish extracts (cod, 62–96% (76% mean inhibition); tuna, 33–98% (69% mean inhibition); salmon, 41–95% (70% mean inhibition) by the CAP-FEIA system. However, de Martino et al (1990)  reports that this may not extend to clinical symptoms in all cases with only 5/20 cod allergic children giving a positive skin test with carp extract. Studies have not focused on the clinical data on carp allergy but have used carp because carp parvalbumin is a model parvalbumin and was the first with a known sequence and 3D-structure. Bugajska-Schretter et al. 2000  also showed that histamine release from basophils occurs with purified parvalbumin and suggest that this test may be useful as fish extracts can sometimes mimic allergy by containing histamines. Taylor, S. L., Kabourek, J. L., Hefle, S. L.
Swoboda I, Bugajska-Schretter A, Verdino P, Keller W, Sperr WR, Valent P, Valenta R, Spitzauer S.
Recombinant carp parvalbumin, the major cross-reactive fish allergen: a tool for diagnosis and therapy of fish allergy. Bugajska-Schretter A, Grote M, Vangelista L, Valent P, Sperr WR, Rumpold H, Pastore A, Reichelt R, Valenta R, Spitzauer S.
Purification, biochemical, and immunological characterisation of a major food allergen: different immunoglobulin E recognition of the apo- and calcium-bound forms of carp parvalbumin. de Martino M, Novembre E, Galli L, de Marco A, Botarelli P, Marano E, Vierucci A. Allergy to different fish species in cod-allergic children: in vivo and in vitro studies. Swoboda I, Bugajska-Schretter A, Valenta R, Spitzauer S.
Recombinant fish parvalbumins: Candidates for diagnosis and treatment of fish allergy. Allergen epitopes:Bugajska-Schretter et al. (1998)  show that IgE binding to carp beta-parvalbumin is very much stronger in the presense of calcium, when the protein is in its native folded form, suggesting that the epitopes are primarily conformational. Bugajska-Schretter et al. 2000  report that binding of IgE from 4 sera from fish allergic patients to carp parvalbumin is reduced 59%, 51%, 79%, and 27% on removal of calcium. Bugajska-Schretter et al. 2000  used 30 minutes boiling to remove other proteins in the purification of carp parvalbumin. Carp parvalbumin is either stable or can quickly refold in the presence of calcium. Allergenicity will survive cooking. Studies in mice with antacids suggest that carp parvalbumin is digested by pepsin in vivo in normal gastric conditions but survives if the gastric pH is raised (Untersmayr et al. 2003 ). Cod parvalbumin similarly survives in simulated gastric fluid if the pH is above 2.5 (Untersmayr et al. 2005 ). Nature of main cross-reacting proteins:Preabsorbtion of sera from fish allergic patients by purified carp parvalbumin either abolished or greatly reduced IgE binding to nitrocellulose-blotted extracts of carp, cod, eel, perch or salmon (Swoboda et al 2002 ). Bugajska-Schretter et al. 2000  report more quantitative data showing that preabsorbtion of sera from 11 fish allergic patients by carp parvalbumin caused mean inhibition of IgE binding of 81% to cod (55%-91%), 89% to tuna (60%-98%), and 78% to salmon extract (55%-93%). Similarly, Swoboda et al (2002)  reported that when sera from 16 fish-allergic patients were preadsorbed with rCyp c 1.01, this strongly inhibited IgE binding to natural fish extracts (i.e. cod, 62–96%, 76% mean inhibition; tuna, 33–98%, 69% mean inhibition; salmon, 41–95%, 70% mean inhibition). Raw carp muscle (1 g) was homogenised under liquid nitrogen, dissolved in 8 ml of phosphate-buffered saline containing PMSF (1 mM) and extracted overnight at 4°C with constant stirring. Total carp muscle extract was boiled for 30 minutes and precipitated proteins were removed by centrifugation at 4500 rpm for 10 minutes at 4°C. Carp muscle parvalbumin isoforms were enriched in the supernatant by addition of ammonium sulphate to a concentration of 60% (w/v). After centrifugation, the supernatant was dialysed against water and the parvalbumin-enriched fraction was lyophilised, redissolved in Tris 10 mM, pH 7.5, and applied to a DEAE Sepharose column (DEAE Sepharose Fast Flow column, Pharmacia Biotech, Uppsala, Sweden). Fractions containing purified parvalbumin isoforms were eluted with a linear salt gradient of Tris 10 mM and NaCl 0.5 M, pH 7.5. Serum IgE from patients allergic to fish and a monoclonal anti-parvalbumin antibody bound to the purified 12 kDa carp parvalbumin isoform but not to the 13 kDa and 14-15 kDa bands (Bugajska-Schretter et al. 2000 ). Carp parvalbumin was the first parvalbumin sequenced and to have its 3-dimensional structure reported. This lead to the identification of the EF hand fold. Other 3-D structures are available of beta-parvalbumins from whiting, Merlangius merlangus, 1A75, silver hake, Merluccius Bilinearis, 1BU3, and pike, Esox lucius, 1PAL. Carp parvalbumin has been frequently chosen as a model parvalbumin in studies including a mouse model for fish allergy (Untersmayr et al. 2003 ). It was also used to calibrate the allergen detection method of Lu et al. (2004) . Lu Y, Oshima T, Ushio H.
Rapid detection of fish major allergen parvalbumin by surface plasmon resonance biosensor. Untersmayr E, Scholl I, Swoboda I, Beil WJ, Forster-Waldl E, Walter F, Riemer A, Kraml G, Kinaciyan T, Spitzauer S, Boltz-Nitulescu G, Scheiner O, Jensen-Jarolim E.
Antacid medication inhibits digestion of dietary proteins and causes food allergy: a fish allergy model in BALB/c mice. Untersmayr E, Poulsen LK, Platzer MH, Pedersen MH, Boltz-Nitulescu G, Skov PS, Jensen-Jarolim E.
The effects of gastric digestion on codfish allergenicity.